I'm not a huge fan of pasta, preferring to get my carbs via grains, potatoes, or beer. Pasta, to me, is kind of boring, not especially filling, and mostly a delivery mechanism for sauce. Last week, I had a pasta experience that changed my mind completely. The trick? Making it from scratch. My dear friend and fellow MFA student Jen invited Nathan and me to dinner last week, where she promised to teach us the fine art of making pasta. She has an old-school, hand crank contraption (pictured above) that she swore would turn a mix of flour, egg, and oil into delectable strands of spaghetti. I had my doubts, but decided to trust Jen. We opened a few bottles of wine, threw together the dough, and got to cranking. I crank the contraption, while Jen catches the pasta. Earlier that day, I made a batch of vegan pesto (two cups of loosely packed basil leaves from my garden, a clove of garlic, a squeeze of lemon juice, a tablespoon of nutritional yeast, a dash of salt, a glug of olive oil, and a few swirls in the food processor - heaven!) which we served with the pasta. Honestly, I could have eaten the pasta plain - it was delicious, chewy, and melt in your mouth good. I'm getting hungry again just thinking about it. Fresh pesto to go with our fresh pasta. While pasta making created a big mess, it actually wasn't that difficult or time consuming, and the prize at the end made the clean up worthwhile. 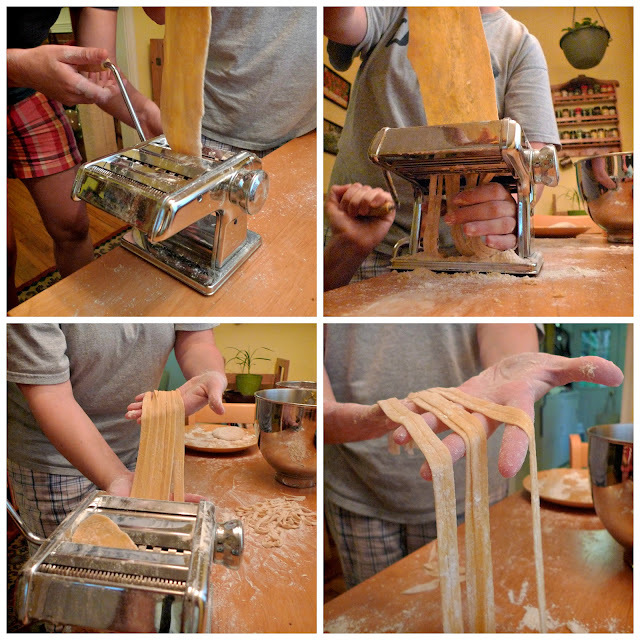 I'm even thinking of searching for my own old school, hand crank contraption (after I learn the official name, of course) so I can make homemade pasta a regular habit. You could argue that cooking is the activity that most defines us as humans. Dolphins have a language; crows can create tools. But only humans can cook. By cooking, we transform the mundane into something sacred. And then we share it with others.